1 packet of red jelly crystal (use aeroplane jelly or Nona jelly crystal), follow instruction on the packet. Arrange the sponge cake or fingers in a clear bowl. Pour orange juice onto the cake. Spoon over the jam or spread the berries. Pour in the jelly mixture. Let it cool and place it in the fridge. Whisk the egg yolk and sugar in a mixing bowl. Add vanilla essence, flour and mix well. Heat milk in a saucepan until almost boiling. Pour the hot milk into the egg mixture and stir with a whisk. Pour the custard mixture back into the saucepan. Keep stirring over low heat until its thickened. Sieve the mixture and let it cool. 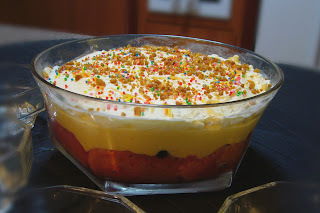 Pour the cooled custard over the set jelly and refrigerate. Alternative for the custards: Mix about 3 tbspn of custard powder with 1/2 cup of milk. Mix it well. Heat 400ml of milk in a saucepan until about to boil. Pour in the custard mixture, sugar (4 tbspn or more depending on your liking) and stir well until thickened... Leave it to cool and pour over the jelly.